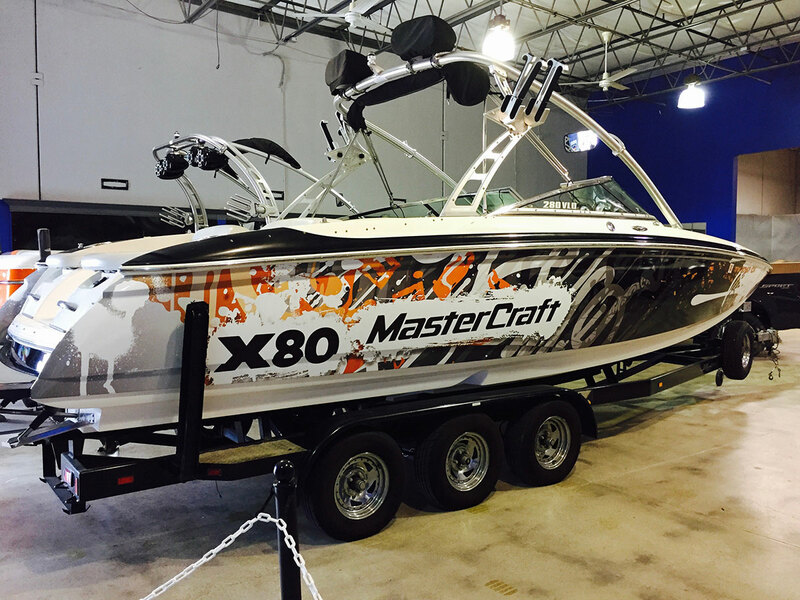 Let us turn your boat into a one-of-a-kind custom show stopper! Our large-format, HD printers ensure high-quality images that meet the highest standards for detailed boat wraps. Let our designers transform your boat from factory stock to custom amazing! Be the envy of the lake and let them know you have arrived. Our team has designed and wrapped a wide variety of boat styles and sizes. Whether you have a bass boat, pontoon boat, wakeboard boat or a 42’ Fountain boat we can deliver! If you’re interested in custom boat wraps in Fort Worth, TX, don’t hesitate to give Metroplex Wraps a call today! 817-997-4431 We offer boat wraps to customers anywhere in the DFW Metroplex or surrounding areas. We can help you design the perfect look and feel, ensuring eye-catching graphics and an attention to detail that can’t be matched. Our installation technicians are experienced in wrapping a wide variety of boat styles and sizes. Our years of experience have taught us the fastest, most effective ways to wrap even the most stubborn contours, ensuring a watertight seal that will protect your boat from harmful UV rays, dirt and small debris. If you’re interested in custom boat wraps in the DFW Metroplex and all surrounding areas, don’t hesitate to give Metroplex Wraps a call today! 817-997-4431 We can help you find the perfect design for your needs, ensuring eye-catching graphics and an attention to detail that can’t be matched. Whether for personal use or commercial advertising, our boat wraps are sure to stand apart from the rest and look great for years to come! We can help you design the perfect look and feel, ensuring eye-catching graphics and an attention to detail that can’t be matched. If you’re on a water ski or wakeboard team, we can wrap your boat in team colors! Updated on September 19, 2018 at 8:15 pm by Metroplex Wraps.